Me singing in Joel Laguidao’s karaoke cab in Washington, DC in November 2011. Some two months later, in January 2012, Joel invited me to return to Washington. The occasion: that city’s news bureau of a Taiwanese television station, TVBS, was planning to film a segment about his karaoke taxi. The idea behind Joel’s generous invitation was that by joining him on the evening when that filming took place, I would have the chance to be interviewed. How could I say no to such free publicity, even if the interview would only be watched by people on the other side of the planet whom I would never meet? It was therefore an easy decision for me to hop on a train back down to D.C.. 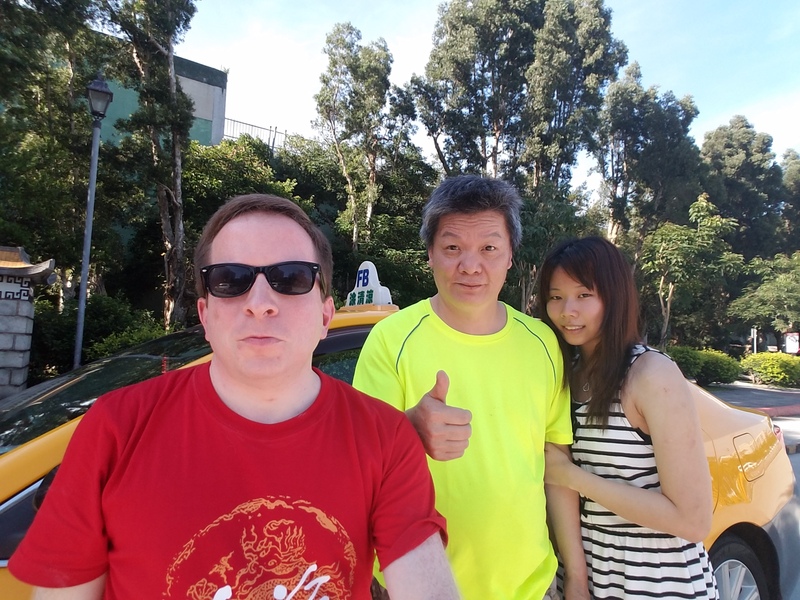 Thus, it came to pass that the Taiwanese news crew recorded me singing in Joel’s cab, and also interviewed me about my background as a globetrotting karaoke-er. I briefly discussed that evening here. I understand that the interview with me was, in fact, broadcast in Taiwan. While no video of it was made available to me, the station sent me a screen capture from the telecast, which you can see on the right. Following my January 2012 ride with Joel, over three years would elapse until my next visit to Washington, DC. But when next I found myself in that city, in March 2015, I made sure to look up Joel. By now he was no longer operating a taxi; instead, he’d become a driver for the private car service Uber. One thing had remained constant: just like the Ford Crown Victoria that Joel had formerly driven for a taxi company, the Lexus that he now piloted for Uber contained high-quality karaoke equipment. It seemed like old times as Joel drove me around in that Lexus and I belted out some of my favourite tunes during the course of the ride. You can read more about my 2015 reunion with Joel here. Let’s now return to 2016 — to Monday afternoon, May 30th. 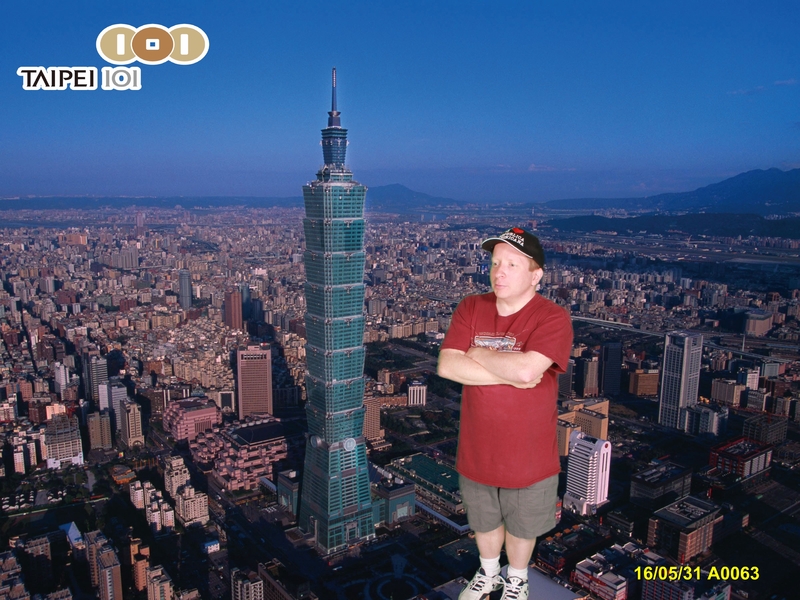 I’d just arrived in Taipei, and I was jonesing to sing karaoke that night. But, after a session of googling in my hotel room, I’d failed to generate any leads on public karaoke venues. So I descended to the lobby level and headed to the concierge’s desk for assistance. My greatest fear was quickly confirmed: the reason that I hadn’t managed to locate any establishments with public karaoke was because there were none to be found. The concierge staff was certain of that conclusion. I was told that, in contrast, KTV clubs were abundant in Taipei; but singing by myself in a private room wasn’t my idea of a good time. But I refused to give up! 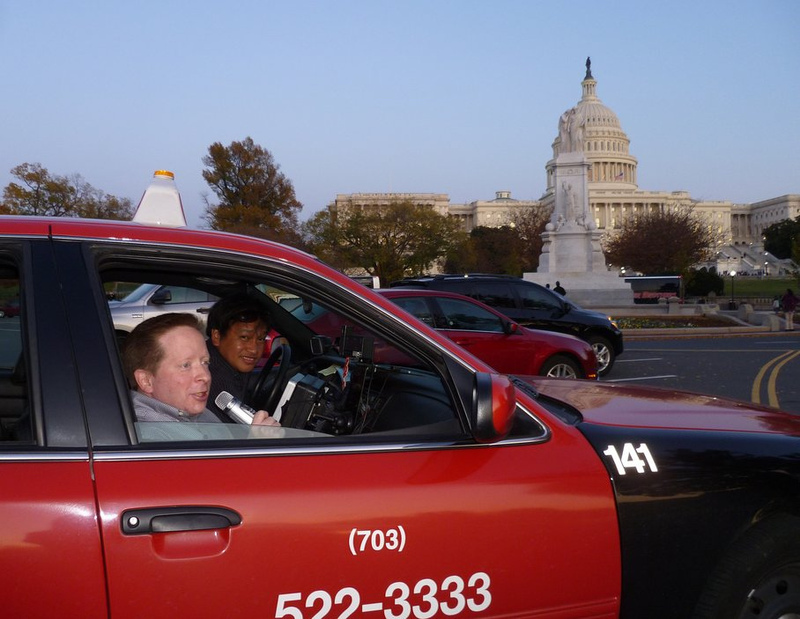 Thinking outside the box, I recalled that when I was researching my posts for this blog about my karaoke rides with Joel Laguidao in Washington, DC, I’d learned that Washington isn’t the only locale in which one can find vehicles for hire with on-board karaoke. Karaoke taxis also serve numerous other cities around the world — including Taipei. In my previous posts I’d even identified Taipei as one of the towns lucky enough to be served by karaoke cabs! Here’s an excerpt from a post I published on this blog in March 2015, in which I specifically named Taipei as a city that had at least one karaoke taxi! Little did I know that this information would be quite useful to me the following year! Inspired by this recollection, I asked the concierge if he could find me a karaoke cab. Still, when I brought up that idea, it was kind of an act of desperation; I had no idea how many such vehicles there might be in Taipei — or whether contact information for any of their drivers was even publicly available. So here’s where I have to give major props to the concierge desk at my Taipei hotel. The concierge with whom I was speaking went onto the internet; and almost instantaneously, he told me that he’d obtained the mobile number of a karaoke taxi driver named “Mr. Tu.” He called Mr. Tu and arranged for him to pick me up in less than two hours! My rolling rendition of Roy Orbison made Taiwan the 41st country on my World Karaoke Tour — and the first since The Bahamas this past February! One downside of travelling solo: unlike during my rides with Joel in Washington, I didn’t have any friends or television crews joining me who could film me during my ride with Mr. Tu. So I needed to serve as my own videographer, by using my selfie stick to record myself singing on my smartphone. I like how Mr. Tu’s video provides a better, more natural angle than the selfie videos that I produced. And I didn’t need to ask him to make it; Mr. Tu regularly creates videos of his passengers singing, which he then posts on his Facebook page. At the end of the evening, I was excited that I’d successfully karaoked in Taipei, and that my tally of countries in which I’ve made karaoke appearances had thereby climbed to 41. At the same time, I felt a lingering sense of disappointment. Because I was holding my selfie stick for the entirety of each of my songs, I needed to remain as motionless as possible while singing, in order to prevent the camera from shaking. Obviously, I didn’t want the karaoke videos that I was self-filming to induce vertigo in viewers. 🙂 As a consequence, my performances in the backseat of Mr. Tu’s car were virtually devoid of any physical component — and in my opinion, that makes the videos of those performances relatively uninteresting. For that reason, while I have additional video footage from my evening ride with Mr. Tu, I’m not going to share it with you. 🙂 Fortunately, though, things would go differently during my encore outing with Mr. Tu. Wednesday, June 1 was an extraordinarily hot day in Taipei. That afternoon the mercury would peak at 38.7 degrees Celsius (101.7 degrees Fahrehnheit). It was the third hottest day in the history of the city. Well, to be more accurate, it was Taipei’s third hottest day since the advent of meteorological recordkeeping. 🙂 Semantics aside, it was muy caliente. That presented a challenge as to how I was going to spend the day. Normally when I’m on holiday and touring a destination, the heart of any given day will be devoted to strolling around and seeing as many sites as I can fit in. But the triple-digit temperatures called for a different approach. Concerns over the possibilities of dehydration, heat stroke, and exposure to what must have been a sky-high UV rating all motivated me to reduce my amount of time spent outdoors before sundown. While I did engage in some sightseeing on June 1, I paced myself and took fewer walking excursions than I normally would have. And in mid-afternoon, I decided to go for a ride in a certain air-conditioned automobile driven by Mr. Tu. 🙂 While aboard, I once again took full advantage of his karaoke equipment. And there was a surprise in store: this time he brought along his girlfriend, Shani Song. Yes, Shani has the perfect surname for the significant other of a karaoke cabbie. 🙂 From her perch in the shotgun seat, Shani was able to serve as my videographer — thus freeing me up for a full range of movement during my songs! Well, as much movement as was possible in light of my seated position. 🙂 I’ll also admit that I was a rebel and rode sans seatbelt — further facilitating my ability to supplement my vocals with dance moves. I was then treated to a performance of a Taiwanese song by Mr. Tu! Selfie of me with Mr. Tu and his girlfriend, Shani. And here’s a photo that Shani took while I was snapping a selfie an ussie of Mr. Tu and me! Caught in the act: me taking an ussie with Mr. Tu! The distinctive Taipei 101 skyscraper is visible in the background. By the way, given my oft-stated enjoyment of performing in front of audiences and seeking to win over potentially hostile crowds, you might wonder how I could have gained fulfillment from singing in the presence only of Mr. Tu and Shani (and, on the evening when he first drove me around, in the presence only of Mr. Tu). You should be aware that Mr. Tu blasts the music from his taxi at a sufficient volume that my singing was quite audible to people outside the car. 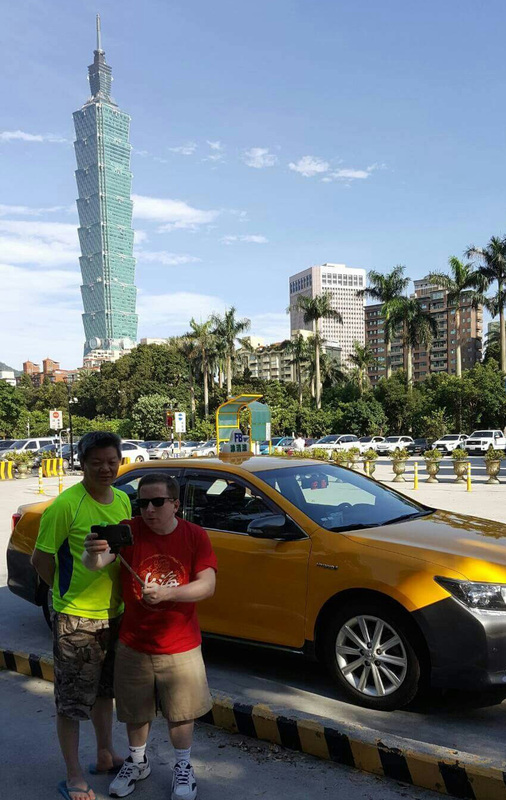 Thus, many Taipeinese people heard me karaokeing as Mr. Tu guided his cab around the city. Admittedly, most of that incidental audience would only have heard brief snippets of any of my songs; but still, random occupants of other cars, as well as pedestrians, were exposed — however briefly — to H-Bomb karaoke. 🙂 Plus, Mr. Tu was entertaining, generous, and an all-around great guy; and it should be obvious from the videos that I had a really amazing time singing in his taxi. It also bears mentioning that without singing in a karaoke taxi, I would have had to forego adding Taiwan to my World Karaoke Tour. Instead, the 41st country was in the books, and I looked forward to making North Korea number 42 later in the week! As for Mr. Tu’s physical appearance, you’ll probably have noticed that he doesn’t bear much of a resemblance to Mr. T. But I pity the fool who doesn’t get the chance to karaoke in Mr. Tu’s taxi! 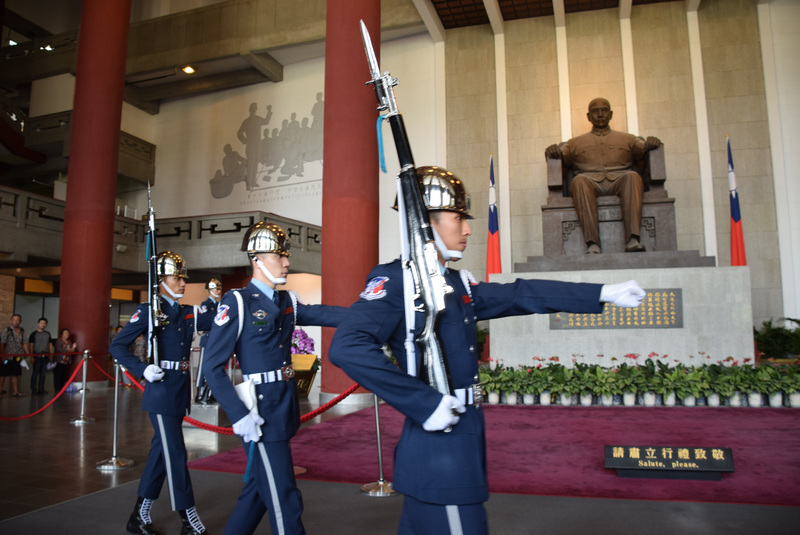 The changing of the guard in Sun Yat-sen Memorial Hall in Taipei. Would you like to ride in a karaoke cab? How fun and what an inventive niche. We have karaoke in the town I live in on Sunday nights, but for some reason (mostly that I can’t sing) I never go. I love the fact that you are travelling around the world singing karaoke and that you appeared on Taiwanese TV. Genius! I will be following your journey from now on! @Amanda: Thank you. 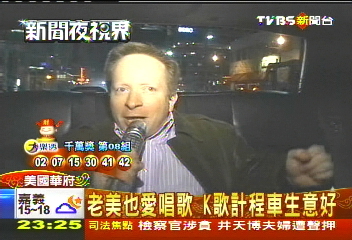 I only wish I could have seen my appearance on Taiwanese TV. 🙂 Anyway, glad to have you along for the journey! That’s interesting and hilarious! Thanks for sharing the joy through this blog, and the videos. @knycx: I’m glad you enjoyed i! I’d be curious to hear about your own taxi experience in Taipei. This is the first time I come across a karaoke traveler! In fact I have never heard of such a thing. It is so fresh an idea 🙂 So I am curious to know, when you travel as a karaoke singer, don’t you get nervous by the new country and the new audience? I tried karaoke a few times and failed as I did not have the confidence to even sing in front of a know crowd. Have you ever been to India? @Salini: I get nervous when singing in a new country, but not because of the local audience. After all, they’re just a bunch of people whom I don’t know and (in most cases) will never see again. Besides, I always have confidence that the crowd will like me. The reason I’m nervous is that I’m making a video of my performance, and I know that people from around the world — including my friends and family — will be watching the video at a later time on my social media and this blog. 🙂 I always feel more pressure when I’m singing in front of people who know me. Plus, I want videos that I post on this blog to show me in a good light. And yes, I’ve been to India, in 2014. I sang in New Delhi, Jaipur, and Mumbai. I blogged about my karaoke experience in New Delhi.